What makes the anecdote funny is something that many people intuitively grasp, but that neither Barack Obama nor Joe Biden have explicitly emphasized in the debates: benevolence is not a substitute for legal and political protection. The idea that generosity is enough to protect marginalized groups is comical in the abstract, but could become a lot less funny on November 6th. Unfortunately, the real distinction between charity and good public policy has been increasingly hard to see on the campaign trail. In the last few weeks, the Romney campaign has persistently blurred the line between personal magnanimity and a system that is structured so that all people get a fair shake. All true, and hats off. However, the core absurdity of “binders full of women” lies beyond Thoreson’s claim that charity is no substitute for rights. He is correct, of course, to remind us that one anecdotal instance of benevolence toward women in no way reduces our need for equal protection under the law. But Thoreson is highlighting the absurdity of Romney’s story, not of this specific phrase. I understand how one might conflate the two, but they are actually quite different. Allow me to state my case. If you look in most places on the Internet, you’ll find enthusiasts intuit an absurdity that comes from these words themselves: Binders, full of women. Jokes center around a singular image: Women, trapped in Romney’s binder. Why? What’s the intuition? These jokes are not about charity versus rights. They are about the objectification of women. And this is why: By using “binders” as the collective term for “women,” Romney reveals an insensitivity to personhood that borders on blindness. Note that we never say, “Put that stack of men on my desk.” Rather, we say, “Leave that stack of resumes on my desk.” This is a precise, grammatical construct. People must never be respectfully clumped in collective terms reserved only for collective objects. We never respectfully say “a pile of people,” “a heap of players.” We say “a group of people,” “a team of players,” “a crowd of fans.” Some collective terms have become colloquially acceptable for accompanying objects AND subjects. A “handful” of people. A “handful” of dust. English has a beautiful way of honoring personhood – that is, humans as subjects – with its own set of collective terms. The subtlety with which we employ these terms reflects not only a command of language; it reflects our subconscious understanding of respect. When Romney says, “Binders full of women,” we cannot help but intuit his sense of women as collective objects. This, not Thoreson’s claim, is the absurdity that spawned an entire meme. I think the point Thoreson wants to make is solid. Yes, the state needs to issue a viable bare minimum that will ensure civic responsibility. Only law will protect rights and hold us accountable to our least advantaged. Charity can only hope to do so. 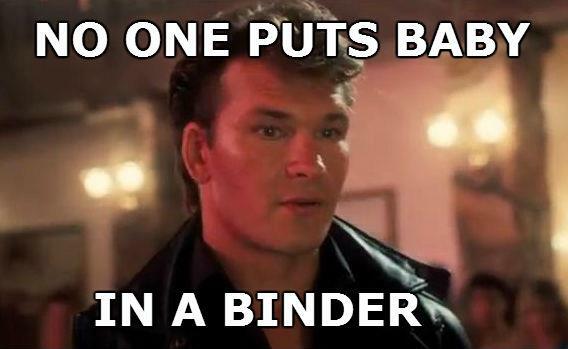 But that he anchors his point with “binders full of women” is…a bit odd. Thoreson wants to stress that it isn’t enough for Romney to be charitable, but he’s making his point with a man who refers to women as collective objects. Clearly, not a poster-boy for ideal charity. That Romney is such a weak example of charity actually undermines Thoreson’s point. If you tear down a house made of straw, that doesn’t make you look strong. It’s unimpressive. If you point to a weak example of charity and say, “See? Never really works,” you aren’t proving that it doesn’t work. You need to engage with its most rigorous form and tear that down in order to build a truly effective case against it. A strong argument in favor of rights over charity would be if Thoreson showed how, regardless of a church or community’s strength and commitment, social movements inevitably fall short of delivering the absolution that social policy can offer. Romney is not the guy to help him make this point. So I wonder if Thoreson using this example illustrates his own (ever-so-slight) confusion about what he wants to argue. The salience of our examples speak to the clarity of our ideas.